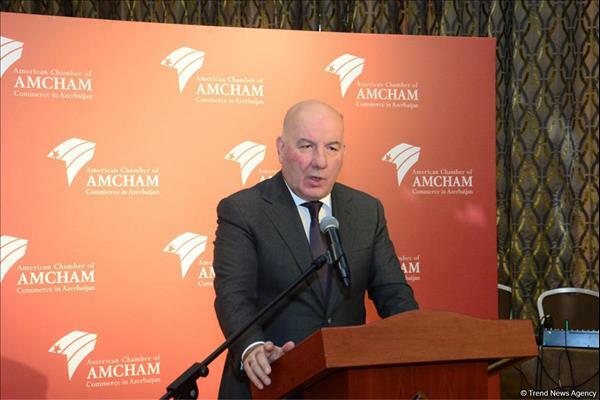 In 2018, the volume of money supply in the economy of Azerbaijan has grown by more than eight percent, Elman Rustamov, the Chairman of the Central Bank, said at a meeting with members of the American Chamber of Commerce in Azerbaijan (AMCHAM) Oct. 31. Rustamov noted that despite the fairly large liquidity in the banking sector, there are still problems in redirecting these funds to the country's economy. "Although there is activity in the banking sector, it is uneven, that is, it does not fully cover the entire sector. In general, the upcoming tasks should be aimed at deepening financial stability in the banking sector and further enhancing financial intermediation," Rustamov said. "The increase in government investments and external liabilities supports economic growth. We are now taking serious steps in key sectors of the economy, especially in the sphere of trade, non-oil sector and agriculture. In addition, a 13 percent increase in non-oil exports shows that the strategy of diversifying the economy and exports has already started," Rustamov said. From the point of view of macroeconomic stability, sustainability and economic development, the current year will demonstrate good performance, Rustamov noted. "We understand that the business circles are interested in more long-term prospects and what will happen in the coming years. In general, our message is positive, and further deepening of macroeconomic stability and sustainability has been scheduled for the coming years. The acceleration of economic growth is expected. The intensification of non-oil exports and foreign exchange earnings from various sources allow us to predict the provision of the balance in the foreign exchange market next year. The Central Bank believes that the proper harmonization of monetary and fiscal frameworks is necessary for the implementation of the plans. In general, the implementation of a number of important reforms is required in the monetary and financial sphere," Rustamov said. In addition, it is also planned to carry out significant reforms in the field of external debt optimization, and to implement the transition to the medium-term expenditure strategy and to the concept of targeted budgeting, the chairman of the Central Bank said.